Office Organizing: Corporate, Small Business & Home Offices - Energy To Organize! You have a reputation to uphold. You have deadlines that need to be met. You have employees to lead. You have bosses, clients, customers and associates to satisfy. You have a company to run.You have a bottom line to impact. You can’t do it while disorganized. If you are, you’re most likely wasting time and money. 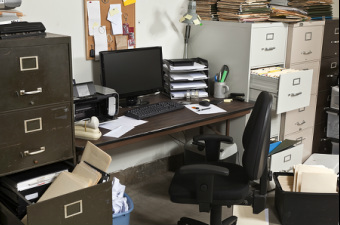 Fact: The Wall Street Journal reported that the average U.S. executive wastes six weeks per year searching for missing information in messy desks and files. work harder than it has to? Invest today in your peace of mind, workflow, creativity and efficiency. It will make a profitable difference tomorrow. *Visit the Before & After Page to be inspired and see a few of the Offices in which Energy To Organize has implemented organizational systems. ETO has the answers, systems and processes to make you successful. If your supply cabinet looks like a tornado passed through, if you or your employees are wasting time looking for missing items, or if you are not maximizing your business potential because the weight of lost time and energy is holding you down, ETO Business Organizing Sessions are the solution. Prices for Business Sessions are negotiated on a per-contract basis. Please contact us to discuss your specific needs. Gift Certificates for co-workers and bosses available upon request. Taken from Organizing from the Inside Out, p. 67. - AuthorJulie Morgenstern.